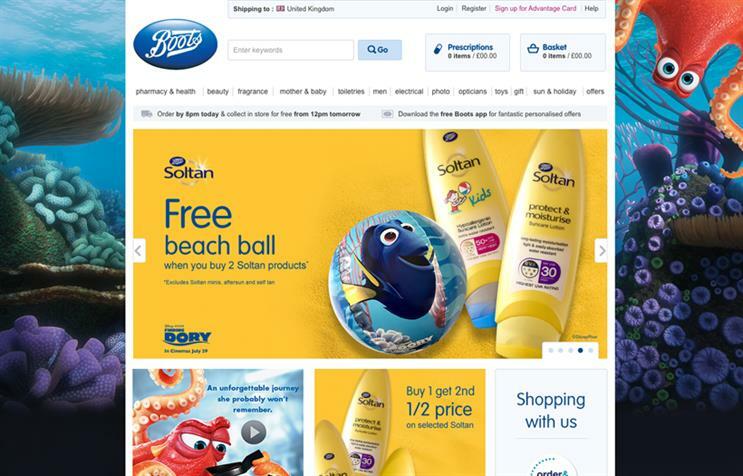 Boots has partnered with Disney for the first time in a linkup between the retailer's sun care brand Soltan and new Disney Pixar movie Finding Dory. The campaign launched in Boots stores yesterday and involves promotional window displays in 695 Boots stores, free-standing display units in 400 stores and in-store audio creative in 330 stores. An offer will see customers that buy two Soltan products receive a free Finding Dory beach ball. The in-store activity is complemented by a takeover of the Boots homepage for four days and banners on the sun care page until the end of August. Boots will also use its loyalty app and social platforms to promote the deal. The sequel to 2003’s Finding Nemo is released in the UK on 29 July and is likely to become one of the world’s highest grossing films of all time, after it had the biggest opening weekend for an animated film in the US. It follows the adventures of forgetful fish Dory, voiced by TV host Ellen DeGeneres, who becomes captured while travelling to be reunited with her parents. It falls to the protagonist of the first film Nemo, and his dad Marlin, to rescue her. "Combining the fantastic creative of Finding Dory with such a strong, recognisable high-street brand such as Boots Soltan is another great example of the kind of creative campaigns Disney can offer big brand partners," said Anna Hill, chief marketing officer of The Walt Disney Company UK & Ireland. Andy Gibson, senior vice-president and chief marketing officer of global brands at Walgreens Boots Alliance, added: "Working with Disney has given us the opportunity to further engage our customers with their really eye-catching Finding Dory promotional material and ensure kids and parents stay safe in the sun. "The release of Finding Dory marks our first film partnership with one of our own brands, which is closely aligned with our message of having a summer of unforgettable fun knowing you and your kids are fully protected." The deal was brokered by Disneymedia+, the integrated ad sales, promotions and marketing solutions arm of Disney UK & Ireland.